Tuscany Travel Guide | The most beautiful beaches of Tuscany |  From Principina a Mare to Ansedonia | Podere Santa Pia, Holiday house in the south of Tuscany. where it flows into the Tyrrhenian Sea in Principina a Mare. The coast of the Maremma is awarded the Blue Flag recognizing the quality and the cleanness of the waters along its shoreline. The stretches of sandy and rocky coastline allow all sea lovers to find the perfect place for them. Moreover, the vast pine tree forests which border the beaches of the Maremma are a real naturalistic treasure. The clear water of the Maremma coast holds first place as the cleanest in Italy. The 160 km of splendid coastline offer endless possibilities for enjoyment. High cliffs alternate with small isolated coves. Long stretches of sandy beaches providing all comforts are protected by lush pine forests. The Maremma seashore, overlooking the Tirrenian Sea, features some of the most beautiful sand beaches of Tuscany. The Maremma boasts several other areas of great beauty and worldwide fame farther away from Grosseto, such as the Argentario peninsula, Talamone, and the Tuscan Archipelago with its beautiful little islands which can be reached by boat from many of the ports and smaller harbours of the Maremma. Principina a Mare is a place mainly bathing fraction of the town of Grosseto. Principina a Mare is quite popular thanks to its proximity to the mouth of the River Ombrone and the Natural Park of Maremma. Marina di Grosseto is a frazione of Grosseto, and is renowned for the Mediterranean maquis shrubland of the Maremma and for its wide beaches on the Tyrrhenian Sea. It houses a fort, known as Forte di San Rocco, built by the Grand Dukes of Tuscany in the 18th century. Few areas in Italy have such a large number of protected areas as does the province of Grosseto. They include the old-established Parco naturale della Maremma, the recent Parco naturale dell'Arcipelago Toscano, thirteen nature reserves and eight others concerned with, for example, repopulation and biogenesis, as well as the WWF nature sanctuaries. Altogether they cover 40,000 hectares, constituting a vast nature reserve contai­ ning all the typical habitats of the coastal strip and the interior, right up to the top of Monte Amiata. The typical images of the Maremma are the butteri (cowherds) keeping a watchful eye on their huge herds of Maremma cattle; and the wild horses frolicking in flat, damp glades; or flocks of water birds taking flight from the lagoons or the ruddy expanses of glasswort reflecting the light of an autumn sunset. Extending from Principina a Mare to Talamone, the park comprises an area to the north of the mouth of the Ombrone with its marshes, ponds and sand dunes, and one to the south dominated by the Monti dell'Uccellina. The Palude della Trappola, near the mouth of the Ombrone, is par­ ticularly interesting. The sand bar delimits bracki­ sh pools known as chio­ ri, where numerous spe­ cies of birds find refuge in the thick reed-beds. Dry in the summer, the chiari come to life in the autumn, when the mar­ shes are once again under water. Passage­ migrants at the Trappola include, above all, various families of palmipedes, while species such as the grey heron, mallard, little egret, black-winged stilt and sandpiper are resident in this marsh. Although at times it's difficult to observe the wild animals in their habitat, visitors won't fail to see the splendid Maremma cattle - deriving from interbreeding with ancient strains of Asian origin - as they wander freely in the meadowland on the edges of the marshes, like the Maremma horses used by the butteri. The first breed suited to this area was selected by the Etruscans, while the Romans introduced Barbary horses from Numidia. These animals may be seen from the straight, shady road lea­ ding to Marina di Alberese, where the beach is partially occupied by the trunks of tree blown down by the sirocco. Lying on the shore, their twisted forms smoothed by the wind, they appear to be modern sculptures serving to stress the undisputed dominance of nature. For those who love nature you should not miss the Natural Park of Maremma, which runs from Principina a Mare to Talamone. The most famous part of the Maremma is the Parco Naturale della Maremma, otherwise known as the Parco dell'Uccellina after the name of the hills that comprise a large part of the park area. The entrances to the park are at Talamone and Alberese. Coastal Maremma is one of the least populated areas of Italy, with large stretches of land left undisturbed for the flora and fauna, which seem, even beyond its boundaries, to be a natural extension of the Parco dell'Uccellina, even though the area has undergone massive reclamation, transforming what was once putrid and unhealthy marshland into habitable terrain. Few places in this world can boast the blessings of land, water and air together in the eternal construction of its beauty. Maremma is one such place carved with artistic hands of all three forces of nature - the land, water and air. The resulting park is a huge area of lush vegetation, exhibiting the various species of animal kingdom and the gentle touch of glorious beaches of aquatic ecological importance. The Maremma Nature Park has well-maintained hiking trails and biking tours and horseback rides in the park are also possible. Moreover the beach of Marina di Alberese is one of the most beautiful places of the Maremma littoral. A curiosity: part of this beach is for nudists. The Parco regionale della Maremma has two entrances - at Alberese and Talamone - from which there's access to the various marked paths in the park. Visits are regulated in dif­ ferent ways in summer (from 15 June to 30 September) and at other times of the year (1 October to 14 June). For information contact Alberese visitor centre, tel. 0564 407098. Almost all the nature reserves are open to public and may be visited on request. Although located within the Parco Naturale della Maremma, entry restrictions do not apply to Marina di Alberese, whose beach - though not as superb as that in the park, rates as one of the best in Tuscany. A short drive away, going south, you can go to the port of Talamone, a picturesque and solitary fishing village. Talamone stands on a little promontory, dominated by an ancient Sienese fortress, to the extreme south of the Monti dell'Uccellina. In antiquity Talamone was an Etruscan port. At the top of the rocky hill you can see a wonderful view, following the coast line of Osa, you see right up until the promontory of Argentario,with its jagged coast, its coves with crystal clear sea. A zone that will leave a lasting charm and certainly unforgettable, also appart from it being interesting, this a very popular destination for skin diving as in the depths of the sea there are beauliful sealife views (for more information: The Argentario Coast Diving Centre). Near to Talamone is the spa of Osa. Here, a spring of suphureous water with a temperature of 32°C is exploited for the therapeutic purposes. The virtues of the waters of Osa have been renowned since time beyond recall. They were in use in Roman times and remains of buildings equipped for thermal cures have been excaved in the zone known as Bagno dell'Osa as well as in the Le Tombe district. 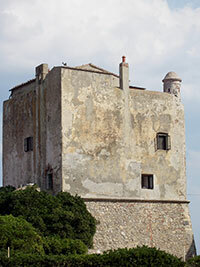 La Torre di Talamonaccio, an historic Spanish tower, perched on top of a cliff which overlooks the sea, was erected to protect against the Saracen invasions. is located along the via Aurelia, the closest village is Talamone at 4 km distance. La Torre di Talamonaccio is soon to feature in the upcoming James Bond film Quantum of Solace. According to a legend handed down from classical literature the eponym of this town was Telamone, the son of Eaco, who landed here with the Argonauts by coming back from Colchide. The Grecian hero died here and was buried under the promontory. An important archaeological discovery made on the Talamonaccio hill concerns some fragments of Etruscan sculpture, which dates back roughly to 150 b. C. and in which is represented the final act of the Edipo’s curse during the war of Seven years against Thebes. From the folk tradition, the name of the country should come from a source of fresh water, bland, in the vicinity of the old path. The beach is 20 metres wide and can be reached from the campingsites south of Talamone. The mouths of the Osa and the Albegna come together at this sandy shore, skirted by a green pine grove. Lit. Ciampoltrini, Giulio and Firmati, Marco (2002) "The Blacksmith of Fonteblanda. Artisan and Trading Activity in the Northern Tyrrhenian in the Sixth Century BC," Etruscan Studies: Vol. 9, Article 4. Albinia, a modern agricultural trade centre anda considerably tourist seaside resort, rises near the mouth of the Albenga river, from which it takes the name. The presence of the Tower of the Salines, near the mouth, shows that once salt was produced there. The Spanish Forte delle Saline, is located in the frazione of Albinia. Giannella is a long sandy beach connecting the north of the peninsula to the mainland near Albinia and Talamone. A town rich in history, situated on a spit of land that stretches into the lagoon, Orbetello has Villanovan origins and was an important Etruscan centre, as witnessed by the imposing remains of the walls and the numerous finds discovered. Having passed from the Byzantines to the Longobards, from the Aldobrandeschi to the Orsini, from Siena to the Spanish, who in 1557 made it the capital of the Presídi State, Orbetello was largely rebuilt after the destructions of the last war and this has in part altered the old nucleus. Worth seeing in particular are the buildings of the Spanish period: the Medina Coeli gate, the fortifications, the Guzman powder magazine and the Clock Tower. An important mediaeval architectural work is the 14th-century Duomo dell'Assunta, probably built on a previous Etruscan temple, which houses a remarkable marble polyptych of the pre-Romanesque period. The territory around Orbetello is extremely varied. The lagoon's wetland is divided into two pillows by the sea (il Tombolo della Feniglia and Tombolo della Giannella) characterized by long sandy beaches, pinewood forests and Mediterranean bush, while next to the Talamone and Ansedonia heights, the coastline is full of cliffs. The hinterland offers lower heights and vast plains where cultivations alternate with Mediterranean bush. Orbetello is joined to the Argentario promontory by two long, golden sand dunes, known as the Tomboli della Feniglia e della Giannella that offer the visitor kilometres of enchanting, unspoilt beaches. Spiaggia Feniglia. This impressive beach is 7 km long and it has fine white sand and is backed by a lush pine forest. It ends with the lagoon of Orbetello. It can easily be reached from Porto Ercole. The bird sanctuary of the Laguna di Ponente di Orbetello is accessible from the Via Aurelia, 148 km sign. Nearby, at the 150 km sign, is the WWF sanc­ tuary of the Bosco della Patanella; for information, tel. 0564 820297. For visits to the Duna della Feniglia forest reserve, tel. 0564 834086. The effect is particularly fascinating at sunset, when the sun reflected on the water cancels out the delicate outline of the coast and the jagged rocky bulk of the Argentario seems to slowly emerge from the lagoon of Orbetello. Its thick, perfumed macchia, the clear sea and its rugged cliffs were already much apprecia­ ted by the Romans, who built numerous vil­ las overlooking the most beautiful bays. And still today the exclusive holiday resorts of Porto Santo Stefano and Porta Ercole attract tourists from all over the world. Delimited by the sandy isthmuses of the Tombolo della Giannella to the north (17th century) and the Tombolo di Feniglia to the south - which is older and covered with a magnificent pinewood, now a protected area - the lagoon constitutes a unique environ­ ment where the circulation of the water is ensured by a number of channels and infil­ tration through the sand bars. Shallow and fringed with reed-beds, it is a refuge for over 200 species of birds, both resident and passage-migrants. The southernmost part of the coast of the province of Grosseto is also of considerable interest for its environment and landscape. Almost on the border with Lazio and surrounded by reed-beds and fields, the Lago di Burano nature reserve lies parallel to the sea. The Torre di Buranaccio stands isolated in the flat countryside surrounding the lagoon. An excellent view of the elongated form of the lake and its setting, with the ancient and modern hydraulic engineering works that regulate its drainage, may be obtained from the archaeological area of Cosa. Lavender cotton, the sea-lily and sea holly grow on the beach and sand dunes. Besides numerous species of birds, badgers, porcupines and tortoises live around the lake, while the otter may be found in its waters. Monte Argentario is considered as most favorite by many scuba divers across the globe. The richness of the beaches extends to the Orbetello lagoon and the golden groomed beaches of the Feniglia and the Giannella, Capalbio coast and the island of Giglio and Giannutri that can only be called the paradise of the world with its spell bound views of nature. The Argentario area is very popular among lovers of water sports, diving and snorkelling. This a very popular destination for skin diving as in the depths of the sea there are beauliful sealife views (for more information: The Argentario Coast Diving Centre). The Argentario coastline is surely one of the most beautiful areas of Tuscany, with a dramatic cragginess reminiscent of parts of Sardinia. Other than the long sandy beaches of Giannella and La Feniglia, which are well-equipped with bars and other amenities, there are also several other smaller sandy beaches like, Acqua Dolce, Spiaggia Lunga and Cala del Gesso as well as rocky bathing areas like the exclusive Cala Piccola. Other gems like Cala Grande can only be reached by boat. Following the panoramic road west from Porto Santo Stefano takes you to the wilder, less developed part of the island, affording wonderful views of the dramatic coastline along the way. Here there are beautiful unspoilt beaches; some sandy, some with pebbles and others with flat rocks to jump or dive off. These less busy beaches are more difficult to reach by foot, usually down steep inclines or sets of stairs built into the hillside and some can only be reached by boat. As well as views across to Giglio Island, visitors can also admire the striking offshore islet of Argentarola with a private rocky beach in front. Cala del Gesso is a particularly panoramic beach set in a residential area made up of private villas, although it is accessible to the public. Cala Piccola is one of the most exclusive locations in Monte Argentario, where the wealthy and the famous have their holiday villas. The small beach is private to those staying in the nearby villas and is well-serviced with amenities. It has a small patch of sand and otherwise has flat rock platforms from which to swim. Porto Santo Stefano is the largest town on Mount Argentario, and connections leave from here for the islands of Giglio and Giannutri. Porto Santo Stefano is a famous resort with two ports, Porto Nuovo and Porto Vecchio. Dominated by the 17th-century square-plan fortress, built by the Spanish to defend the port, Porto Santo Stefano originated in the 15th century as a fishing village. Fishing continued to be the almost exclusive activity of its inhabitants until not many decades ago, when the town became a famous seaside resort, appealing to a wide range of tourists. In the summer period the fortress is the venue for a wealth of cultural activities and exhibitions. Porto Ercole is located on the eastern coast of the Argentario. It is a charming seaside village that overlooks a bay protected by a small promontory. Tombolo, di Feniglia, view from Monte Argentario. The Feniglia dune, for its entire length and breadth, 6 km by 1 km, is entirely covered by pine-woods. Not to be missed are the characteristic and famous beaches like Feniglia, Giannella and Ansedonia with its golden sand continuing with Torba and Marina di Capalbio with its dark, almost black sand. In Ansedonia you can visit the remains of the “city of Cosa” and its museum on the promontory of the Etruscan Tagliata “Spacco della Regina” with a marvellous view on the Argentario. Next to the dark beach is the historical complex of the Tagliata Tower, also know as the Puccini tower for the famous composer who lived here. The Torre Tagliata was built in the early 13th century as a watchtower for the Spanish troops that occupied this part of Tuscany. Giacomo Puccini, an ardent hunter and fisherman (cacciatore e pescatore), loved the wild marsh land of the Maremma. In 1920 he bought the crumbling tower (torre franante) on the windblown beach and became friends with his only neighbors: the men of the local Guardia di Finanza (a branch of the police), whose caserma (barracks) were next door. Giacomo Puccini who resided here for many years and in the last days of his life began composing the opera Turandot. Extends east of the promontory of Ansedonia. The beach is characterized by sand ranging in color from dark gray to black. Proceeding toward the Lake of Burano and the mouth of Chiarone, the shoreline tends to soften the color and come forward tone between dark gray and gold. The entire stretch of the coastal zone is presented with wild dune vegetation, and Mediterranean retrodunal (macchia). The beach can be reached going from the promontory of the Argentario toward Capalbio Scalo. It has an almost black sand and clear, transparent water. Thick wild scrub and broad dunes encircled the beach. The beaches have an almost black sand and clear, transparent water. Thick wild scrub and broad dunes encircled the beach. Montalto di Castro is a little town on a hill overlooking the coast. It is called Montalto di Castro with reference to the Duchy of Castro to which it belonged for a century. The road leading to the town is dominated by the mass of Castello Guglielmi or della Rocca, a medieval castle built by the Orsini. Pescia Romana, attracted by the beauty of the countryside, by the possibility of going on many different types of excursions, both naturalistic as well as cultural, by the 8 km of beach, all true to their natural state, and by the clarity and cleanliness of the seawater. The beaches of Marina di Pescia, Casalaccio and Costa Selvaggia are particularly well known. They are situated north from Montalto on S1, then follow signs to Marina di Pescia Romana. Marina di Montalto is a tourist resort situated two kilometres from Montalto. Near the mouth of the Fiora is a massive building, which probably acted as grain store, and a square tower, recently restored, probably built in the 15th century. Further south, in the locality of Punta delle Murelle, the ancient structure of Regisvilla port can be seen a short distance from the bank. La Torre di Buranaccio, Lago di Burano, Capalbio. The Buranaccio Tower stands at the centre of the narrow sandy isthmus separating lake from sea. Extending parallel to the coast, Lake Burano and the immediately surrounding district make up one of the most important wetland habitats in Italy in terms of the integrity of the environment and accommodation and teaching facilities. When we talk about the Maremma and its coast, however, we cannot forget to mention the islands of the Tuscan archipelago, a nature sea park, and an extraordinary place for the beauty of its depths and the cleanliness of the seawater. The islands of the Tuscan archipelago, a nature sea park, and an extraordinary place for the beauty of its depths and the cleanliness of the seawater. The Isles known as Giglio and Giannutri in particular are not to be missed. This beautiful piece of coastline can be reached by car through the Parco Naturale della Maremma. The fine-sand beach offers a view of the Uccellina Mountains and the towers and Abbey of San Rabano. A 2km walk along the coast will bring you to the rocky Cala di Forno. 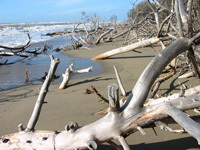 Description A large beach which can be reached from town, nestled among the pine forests and the Maremma Park. This piece of coast is one of the widest in the province with high dunes which meet the beach and a pine forest at its back. Follow indications from Grosseto to arrive. The beach averages about 50m deep with fine-grain sand and an abundance of seaside flora. The turn offs are along the road from Marina di Grosseto to Castiglione della Pescaia. BAGNI DI DOMIZIANO The beach can be reached by leaving the provincial road and walking down a short path. The bay is below the Tower of Santa Liberata where are the ruins of an antique Roman villa. CALA DEL GESSO This beach can be reached from the provincial road 700 metres beyond Cala Moresca following the signs for a paved turning. To get to the sea we have to take a footpath. This beach is ideal in low season as it is well protected from the wind. CALA DEL BOVE Cala del Bove is next to the exit for the beach of Cala del Gesso and it can only be reached from a path. CALA GRANDE The beach can be reached from a footpath after the Torre della Cacciarella. It is a beautiful section of coast where vegetation grows up to the sea. Another stretch of this beach near an oakgrove can be reached by following the path of the old “Fosso del Cauto”. CALA MORESCA | Location Cala Moresca | The pretty cove is named after the tower which dominates the beach. It is a stretch of a cliff, flat and with no sands. It is reached from the sea or from a private entrance on the provincial road. The isle of Argenatrola which faces the cove is a favorite for scuba excursions thank to a stunning submerged grotto with stalagmites and stalactites. Cala Piccola is reached from the provincial road that leads directly to the terraced bathing establishments and the cliffs. Tuscany host some incredible beaches that have become the major attraction to both local and international Naturist tourists. Spiaggia di Marina di Alberese [42.6401N, 11.0597E], Spiaggia della Feniglia [42.4177N, 11.2384E] and Spiaggia di Capalbio [42.3973N, 11.3720E] are within reach of Podere Santa Pia. In Torre del Lago, there is the beach known as La Lecciona, the point of reference of all Italian gay beaches.